Welcome!!! So glad that you stopped by to see what we have been up to in the Thankful Thursday Design Team. Our challenge was to make a card for Grandparent's Day. I know most would say not so challenging, but our family has been through many changes recently. We lost my Father in Law to cancer in June of 2008 then August of 2009 my Father passed away suddenly and quite unexpected. Then April 2010 I lost my Grandad. These three had a great impact on my life and members of my family's lives. Our son who was born in 2004 did not get to know them as well as us as parents. In the time that he had with each one of them I know they each hold a special place. His Grandpa Roli who passed June of 2008; our son remembers the trip we did as family to Michigan to Henry Ford Museum. This was a great trip, but had some challenges. I loved it that I was able to capture many photos and create a video for him before he passed away. My Father as my son would call him "Pa" passed August of 2009. Our son took this very hard ~ they were so close. Most would say the two were attached at the hip. There is a very special picture that I will share with you. I just love the way the two of them were in this. They were having so much fun. When my Father would come and take him for walks sometimes my Father would place him up on his shoulders and take off for the walk. Yes, my son would walk with him, but he does have some issues with his muscles. He is diagnosed with Hypotonia. He also has other issues, sensory integration dysfunction and Dyspraxia. The main one I wanted to hit on was that Hypotonia because he would fatigue so quickly my Father would do this put him up on his shoulders or find a way to carry him back. I loved seeing the two of them together. Now his Grandad was in a nursing care center close to our home; Wednesday's they would let families of the residents come and have breakfast with them. My Grandad would light up when he saw our son come because he knew breakfast would be different and our son would find a way to make him laugh. I loved to see him smile when we'd come in. He'd light up when I'd come to see him as well. I looked forward to these times. When my Grandad passed our son asked to see his room just one more time. I told him that the room was not like we saw it when Grandad was there. He said he understood and just wanted to see the room. I asked them if we could; they said that we could and explained to him that the family had already come and took his things. He said that's ok ~ I just need to see the room. Then we went and he looked and stopped at first then he went to the window and said "Mama, this is the window that I told Grandad about all the birds.... " then he explained more about the room. Then we left for home and he said he felt better. I know this is long, but this challenge was difficult as I said our family has been through many changes. My Mother In Law is now remarried to a wonderful Christian man and they are very happy together. We are very happy for them as well. My Mom is also remarried to a wonderful Christian man who also happens to be my Uncle first as he was my Father's brother, but now he's my Step Dad. He's wonderful with our son and is learning his challenges and how to deal with him. I'm glad that God put these two in our family. I had a hard time because things are so different now and as a family we are all adjusting and I know it will come in time. Now I'm just enjoying the journey and taking things as they come. Now these cards that we made for the challenge are special as I said. So enjoy. 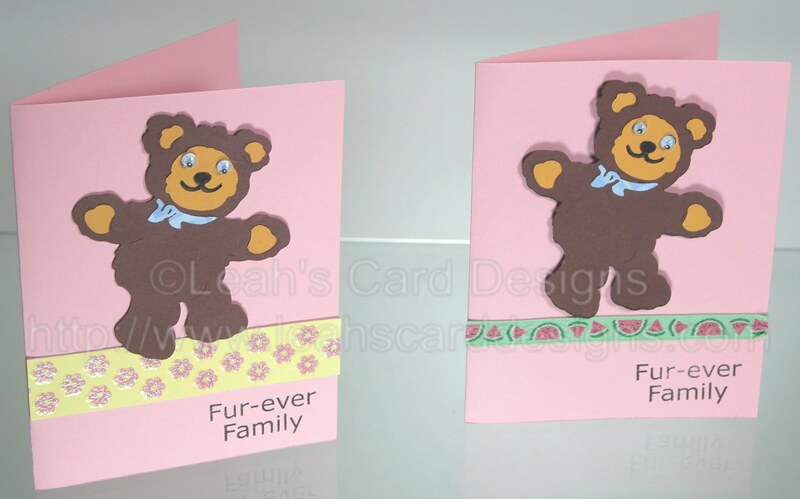 The bear on the front is cut at 3.5 and is from the Sesame Street Friends Cricut Cartridge . 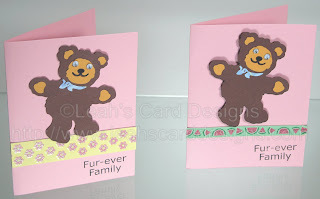 I layered the bear using the Cricut Craft Room. I just love that program. I had fun and son did too he chose the colors and the borders on the front. Then he chose the sentiment for the front. I just got a kick out of the one he chose which is from My Pink Stamper's collection Even More Punny-licious. I had won them in a blog candy and I just love them soo much!!! I really need to get more. They're just so fun! How cute!! I totally LOVE those lil cards. Such a great pic as well!!! Thanks for sharing your stories. I could see why this challenge would be hard for you, but you made some wonderful cards.